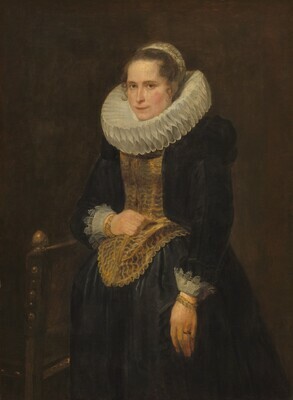 Anthony van Dyck painted this portrait of an upper-class Antwerp woman around 1618, shortly after he registered as a master painter with the Antwerp Saint Luke's Guild. At that time, Antwerp's long-established portrait tradition emphasized a sitter's virtuous character through restrained gestures and a direct gaze. Thus, while Van Dyck's portrait style would ultimately come to be associated with gracefulness of pose and gentility of demeanor, his early portraits are somewhat stiff and formal. The woman in the Gallery's portrait looks directly out at the viewer with a firm but engaging expression. Although her left arm hangs by her side, her right arm is bent at the elbow to allow her hand to rest on her elegantly embroidered bodice. This gesture gives prominence to the gold band she wears on her forefinger, the traditional place to wear a wedding band in the 17th century. Although her identity is unknown, her millstone ruff, bracelets, and ring with a cut gem indicate that she is a woman of wealth and standing. Posed with her body turned to the right, the woman was once part of a pair, as portrait convention placed the woman at her husband's left, or sinister, side. Her husband's portrait is in the State Hermitage Museum in Saint Petersburg, Russia. Van Dyck executed this painting on a coarsely woven canvas, giving his brushwork a broader and richer texture. He enhanced the expressive character of the paint in the woman's face and hand with rapidly applied accents that capture the light as it falls across her form. Indeed, despite working within the constrained portrait conventions of the time, Van Dyck was able to capture a sense of the woman's inner life, a quality that became the artist's hallmark. Pierre Crozat [1665-1740], Paris; by inheritance to his nephews, first to Louis-François Crozat, marquis du Châtel [1691-1750], Paris, and then [on Louis-François' death without a male heir] to Louis-Antoine Crozat, baron de Thiers [1699-1770], Paris; the latter's heirs; purchased 1772, through Denis Diderot [1713-1784] as an intermediary, by Catherine II, empress of Russia [1729-1796], for the Imperial Hermitage Gallery, Saint Petersburg; purchased between June 1930 and April 1931 through (Matthiesen Gallery, Berlin; P. & D. Colnaghi & Co., London; and M. Knoedler & Co., New York) by Andrew W. Mellon, Pittsburgh and Washington, D.C.; his estate; deeded 8 March 1938 to The A.W. Mellon Educational and Charitable Trust, Pittsburgh; gift 1940 to NGA. The dates of the Mellon purchase and deed to Trust are according to Mellon collection files in NGA curatorial records and David Finley's notebook, donated to the National Gallery of Art in 1977, now in the Gallery Archives. La Curne de Sainte-Palaye, Jean-Baptiste de. Catalogue des tableaux du cabinet de M. Crozat, baron de Thiers. Paris, 1755: 12, as Rubens. Tronchin, François. Inventaire des tableaux du Baron de Thiers. 1772. Archives Tronchin, Bibliothèque publique et universitaire, Geneva: no. 177, as Rubens. Imperial Hermitage Museum [probably Ernst von Münnich, ed.]. Catalogue des tableaux qui se trouvent dans les Cabinets du Palais Impérial à Saint-Pétersbourg. Based on the 1773 manuscript catalogue. Saint Petersburg, 1774: no. 955, as Portrait de femme by Rubens. Smith, John. A Catalogue Raisonne of the Works of the Most Eminent Dutch, Flemish and French Painters. 9 vols. London, 1829-1842: 9(1842):301, no. 210, as by Rubens. Hermitage Museum. Livret de la Galerie Impériale de L'Ermitage de Saint-Pétersbourg. Saint Petersburg, 1837: 351, no. 18 (also in 1838 ed. ), as by Rubens. Köhne, Baron Bernhard de. Ermitage Impérial. Catalogue de la Galérie des Tableaux. Saint Petersburg, 1863: 129, no. 581, as by Rubens. Waagen, Gustav-Friedrich. Die Gemäldesammlung in der kaiserlichen Ermitage zu St. Petersburg nebst Bemerkungen über andere dortige Kunstsammlungen. Munich, 1864: 141, no. 581, as by Rubens. Köhne, Baron Bernhard de. Ermitage Impérial. Catalogue de la Galérie des Tableaux. 3 vols. 2nd. ed. Saint Petersburg, 1870: 2:63, no. 581, as by Rubens. Bode, Wilhelm von. "Antoon van Dyck in der Liechtenstein - Galerie." Die Graphischen Künste 12 (1889): 45, as Van Dyck. Rooses, Max. L'Oeuvre de P.P. Rubens: histoire et description de ses tabelaux et dessins. 5 vols. Antwerp, 1886-1892: 4(1890):304, as Cornelis de Vos. Knackfuss, Hermann. Rubens. Bielefeld and Lepzig, 1895: 75, 87, repro., as Rubens. Somov, Andrei Ivanovich. Ermitage Impérial: Catalogue de la Galérie des Tableaux. 2 vols. 3rd ed. Saint Petersburg, 1895: 2:64, no. 581. Cust, Lionel. Anthony Van Dyck: An Historical Study of His Life and Works. London, 1900: 236, no. 58. Rooses, Max. "Die Vlämischen Meister in der Ermitage: Antoon van Dyck." Zeitschrift für bildende Kunst15 (1904):116. Stokes, Hugh. Sir Anthony van Dyck. London and New York, 1904: possibly 45. Bode, Wilhelm von. Rembrandt und Seine Zeitgenossen.... Leipzig, 1906. Bode, Wilhelm von. Rembrandt und Seine Zeitgenossen . . .. Leipzig, 1907: 273. Bode, Wilhelm von. Great Masters of Dutch and Flemish Painting. Translated by Margaret L. Clarke. London, 1909. Schaeffer, Emil. Van Dyck, des Mesiters Gemälde in 537 Abbildungen (Klassiker der Kunst 13). Stuttgart and Leipzig, 1909: 141, repro. Zimmermann, Max. Kunstgeschichte des Barock, Rokoko und der Neuzeit (Allgemeine Kunstgeschichte, vol. 3). Beilefeld and Leipzig, 1910: 150, 153, repro. Bode, Wilhelm von. Rembrandt und Seine Zeitgenossen.... 2nd rev. ed. Leipzig, 1923: 273. Glück, Gustav. Van Dyck: des Meisters Gemälde. Klassiker der Kunst in Gesamtausgaben 13. Revised 2nd ed. New York and Stuttgart, 1931: 101, 529, repro. De Tolnay, Charles. "Flemish Paintings in the National Gallery of Art." Magazine of Art 34 (April 1941): 192, fig. 23, 195, repro. Preliminary Catalogue of Paintings and Sculpture. National Gallery of Art, Washington, 1941: 205, no. 500. Book of Illustrations. National Gallery of Art, Washington, 1942: 249, repro. 42. Paintings and Sculpture from the Mellon Collection. National Gallery of Art, Washington, 1949 (reprinted 1953 and 1958): 67, repro. Jaffé, Michael. "Van Dyck Portraits in the De Young Museum and Elsewhere." Arts Quarterly 28 (1965): 41. Stuffmann, Margret. Les Tableaux de la collection de Pierre Crozat. Historique et destinée d'un ensemble célèbre, éstablis en partant d'un inventaire après décès indédit (1740). Gazette des Beaux-Arts 72 (1968): 104, no. 385, repro. Walker, John. Self-Portrait with Donors: Confessions of an Art Collector. Boston and Toronto, 1974: 116. Walker, John. National Gallery of Art. New York 1975: 258-259, no. 332, repro. Larsen, Erik. L'opera completa di Van Dyck. 2 vols. Classici dell'arte 102-103. Milan, 1980: 2:96, no. 164, repro. Walker, John. National Gallery of Art, Washington. Rev. ed. New York, 1984: 259, no. 326, color repro. European Paintings: An Illustrated Catalogue. National Gallery of Art, Washington, 1985: 144, repro. Larsen, Erik. The Paintings of Anthony van Dyck. 2 vols. Freren, 1988: 2:24-25. no. 34, repro., as George Jamesone. Kopper, Philip. America's National Gallery of Art: A Gift to the Nation. New York, 1991: 95, color repro. Gritsai, Natalia. Anthony Van Dyck. Bournemouth and Saint Petersburg, 1996: 12, 15, repro. Wheelock, Arthur K., Jr. Flemish Paintings of the Seventeenth Century. The Collections of the National Gallery of Art Systematic Catalogue. Washington, D.C., 2005: 26-29, color repro.